Nuventas cyclonic filters exploit centrifugal force to extract grease particles with efficiency of up to 95%. When grease-laden air enters the cyclonic filter, it is forced to transform its path into a series of cyclones. The grease particles in the rotating streams have too much inertia to follow a cyclonic curve of the stream. As a result, the particles strike inner walls of filter channels and permanently stick to it. Comparative study has been carried out at Kaunas University of Technology, where Novameta cyclonic and industry standard baffle (labyrinth) filters have been tested. 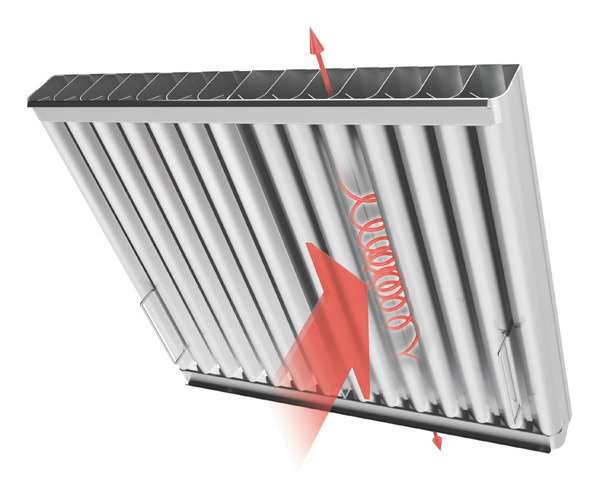 It has been found, that Novameta cyclonic filters are over two times more effective than the common baffle (labyrinth) filters at the same exhaust air flow rate! High extraction efficiency results in more hygienic kitchen environment, reduced fire risks and translates into direct savings to the customer by requiring less frequent duct and exhaust fan cleaning and maintenance. The design of Nuventas filters reduces fire hazard and ensures that highest fire-safety standards are met. The filter has a fully closed backside, which works as a barrier to stop flame penetrating into the hood plenum and the ductwork. Thanks to inclined position of the filters inside the hood, flammable grease does not accumulate inside the filter – gravity causes grease particles drip down to the grease collection trough. Nuventas cyclonic filters are completely made of 0,8-1,0 mm AISI 304 steel and designed to be washed in any commercial dishwasher. Nuventas filters, as well as hoods, have been developed and tested using the cutting edge CFD (Computational Fluid Dynamics) analysis. CFD analysis is being applied to the design and optimization of Formula 1 cars, space shuttle R&D and in numerous of other advanced mechanical and industrial engineering applications. 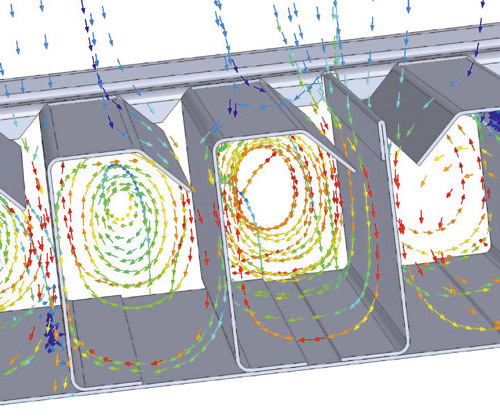 The CFD tests along with a number of experimental investigations at Kaunas University of Technology (Lithuania) and laboratories of FORCE TECHNOLOGY (Denmark) have been made in order to determine the characteristics and behaviour of Novameta exhaust hoods. Novameta hoods are provided with recommended air flow rates and full pressure drop characteristics required to select the most appropriate exhaust fan for the kitchen ventilation system, as well as to conveniently set-up the exhaust hood according to the required exhaust flow rate. 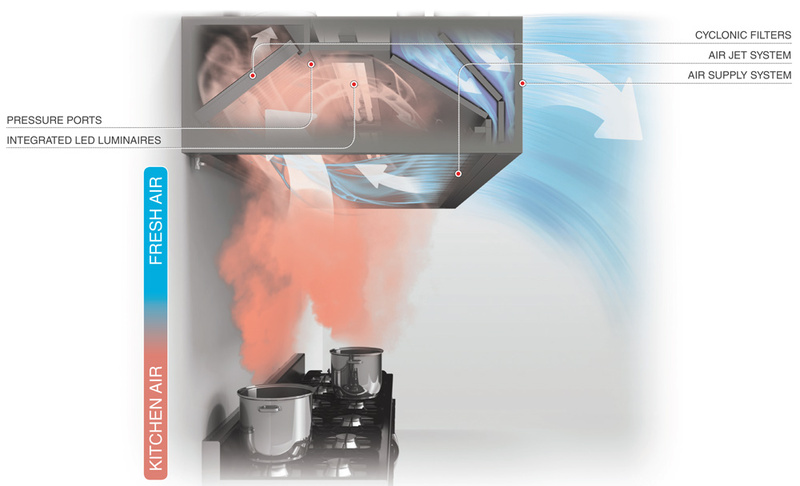 Exhaust hoods with integrated air jet system contribute to substantial energy savings of the kitchen ventilation system. The system takes advantage of the induction effect which considerably increases capture and containment efficiency of the hood. In other words – by supplying around 7% of required exhaust flow rate to the air jet system, it allows to have the exhaust flow rates as much as 20% lower and maintain the same capture and containment efficiency. towards the filters. Secondly, the jets create an air „curtain“, which helps to confine the hot plume inside the hood chamber and minimizes the chances of escaping before it gets exhausted. The induction air jet system is recommended by German VDI 2052 regulation. The air supply system allows to introduce fresh make-up air to the most critical space in the kitchen – next to the cooking equipment. The feature increases comfort levels for the staff, since the fresh air is supplied directly to the most occupied zone with the highest heat loads in the kitchen. The air is supplied through a large perforated panel at low velocity, which allows to avoid drafts, minimize mixing and ensure that the capture and containment efficiency of the exhaust hood is not compromised. 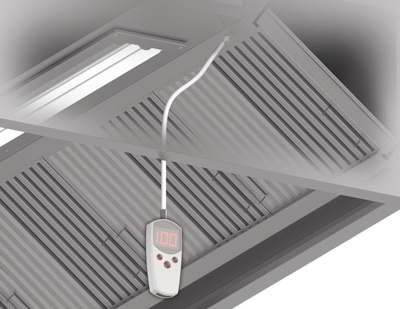 Nuventas exhaust hoods come with full technical specifications – pressure drop characteristics, k-factors and recommended air flow rates. Each hood is supplied with pressure ports, which allow to determine the actual exhaust and supply air flow rates by using a simple manometer and referring to pressure drop characteristics. The feature allows to easily adjust and balance exhaust hoods according to the calculated exhaust and supply flow rates.